Website and processes: 9 Nov 16 Catherine, 5/5 Excellent "Easy to find and book a day. Thanks very much." 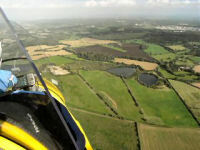 If you have ever fancied flying a rotary wing aircraft then why not consider the gyrocopter rather than a helicopter. They are great fun and will put a big smile on your face whilst using considerably less fuel, flying more quietly and being much much cheaper to fly. Or maybe you are a flex wing pilot and love the feeling of wind on your face but get fed up with not being able to fly because of the wind is too strong? If so then the gyro with 40kts wind tolerance is for you. Subject to suitability of weather the flight can include 'hands on' instruction to see what it feels like. Time flown can count towards your PPL G pilots license. Please note - open cockpit so wear suitable clothing depending on the weather.